Since I started in the hobby of Astronomy, a common problem I come across nearly every session is that of dew forming on the glass of my Telrad finder. My first attempt of tackling this issue proved to be reasonably successful for a short period of time but I found that on the dewiest of nights, the solution would not work as well. My first solution was to use a simple thin foam dew shield as shown in this section of my site. The problem is that the more time you spend looking through the Telrad, the more warm, moist air hits the Telrad mirror from your exhaled breath. Whereas the foam dew shield helps prevent dew from building up when the Telrad is not in use, it doesn’t stop it from misting up when you breathe on it. So, time to start thinking… There are many different solutions that people have come up with to cure this problem. All of which involve gently warming the glass to just above the dew point and quickly clearing any moisture build up. 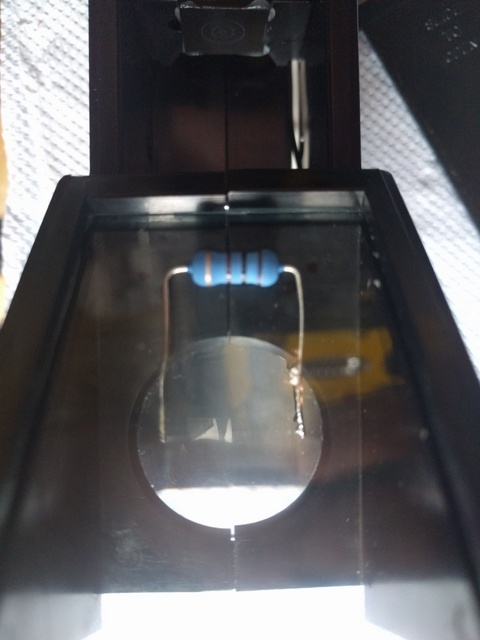 I looked at nichrome resistance wire solutions, serial resistor solutions and purpose built pre-made solutions. However, I come across several threads and blogs of people that had settled on a really neat single resistor solution. This is the type of solution I decide to go for. So, how did I do it? To start with, this is my Telrad before starting the project. You can see the Velcro pads on its side which are used to attach the foam dew shield. The second picture shows the Telrad from the back. 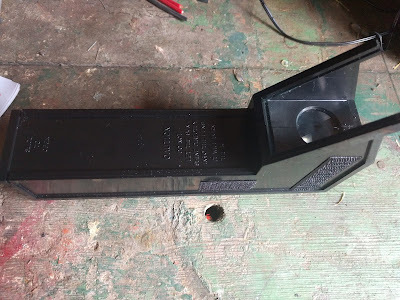 Before I started to pull the Telrad apart, it was time to make a proof of concept rig to show the theory would work well enough to provide a solution. Time to talk about the components. Depending on how warm I wanted the resistor to get within safe reason, would depend on which value resistor to use. The most common ones I had come across used in conjunction with a dew controller were either 100 Ohm 2 Watt or 120 Ohm 2 Watt resistors. 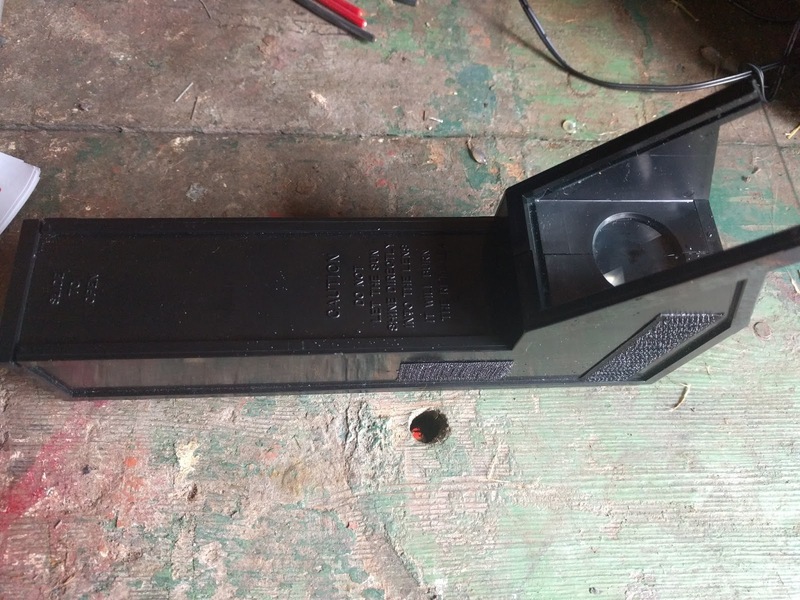 I have already made my own dew controller as documented here . So, I took it out and used it as part of my test rig. 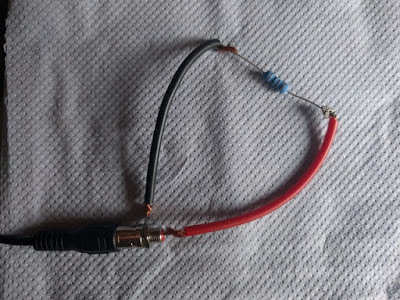 My test rig is made up very simply of an RCA connector, some hook-up wire and a single resistor. After a quick solder job, the rig was ready for testing. The outcome of the test was not really that scientific. As expected, the resistor with the lowest resistance gave off the least heat. When compared to the 120 Ohm resistor, the 100 Ohm resister didn’t get as warm. But, I feel the 100 Ohm resistor got more than warm enough. There is always a chance when doing this sort of test that components can burn out. Back to the Telrad. With the Telrad glass still in place, I took a resistor, and offered it up to a point where the resistor was touching the bottom of the glass. From here, I was able to determine where the holes were to be drilled into the plastic body of Telrad. 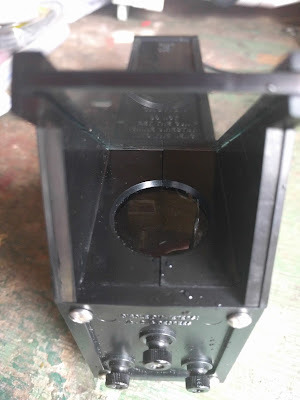 Once the marks were made for the drill holes, I then removed the Telrad glass which give me the access to drill the holes. This is when things started to get very fiddly. Once the resistor legs were bent into place, and the resistor was mounted through the holes, I needed to solder two short lengths of hook-up wire to the resistor, but avoiding the Telrad’s own components. It required a very steady hand and a lot of patience! Following on from that, I drilled a small hole in the side of the Telrad body, through which I mounted the female RCA connector. Again, this needed a steady hand to avoid burning any of the internal parts critical to the working of the Telrad. 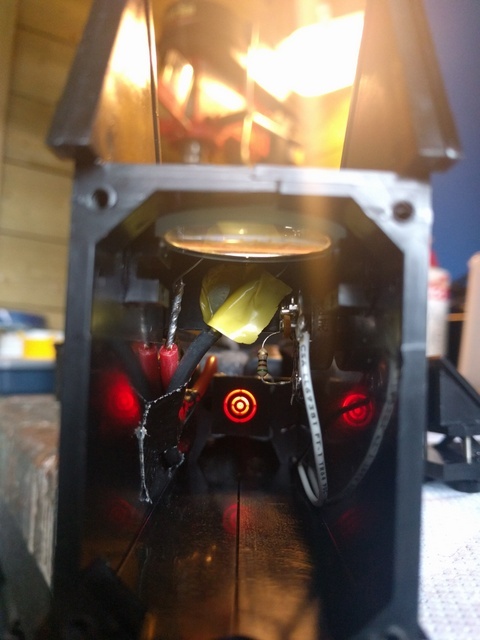 Now that all the soldering was done, it was time to make sure that the extra wires that I had put inside the Telrad to accommodate the power supply to the resistor, were held out of the light path of the red light, mirror and lens which projects the red circle image onto the Telrad glass. The easiest way of doing this was just by using small pieces of electrical insulation tape and gaffa tape. 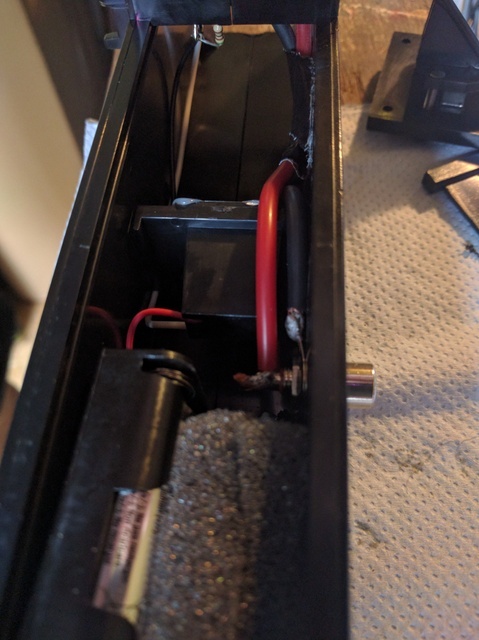 The next picture shows how cramped the inside of the Telrad body is, and the area you have to work within when soldering. The Telrad’s own components can be seen on the right side of the picture. 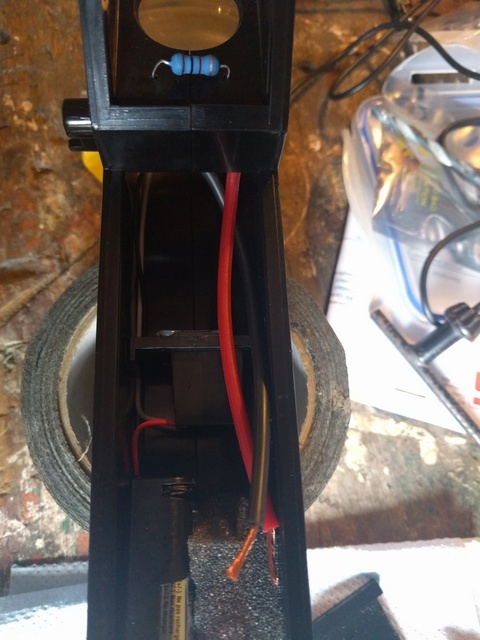 The hook-up cable connected to the dew heater resistor is held into place using the yellow insulation tape. I re-assembled the Telrad. 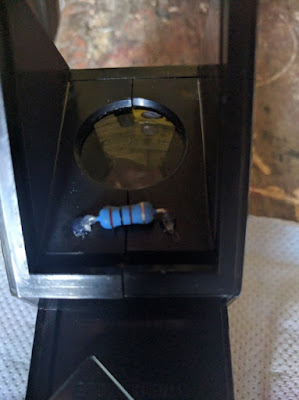 Finally, to hold the resistor in place, before replacing the Telrad glass, I used the hot glue gun to put a very small dab of glue at on each of the ends of the resistor to make sure it was held into place. The final test proved successful. 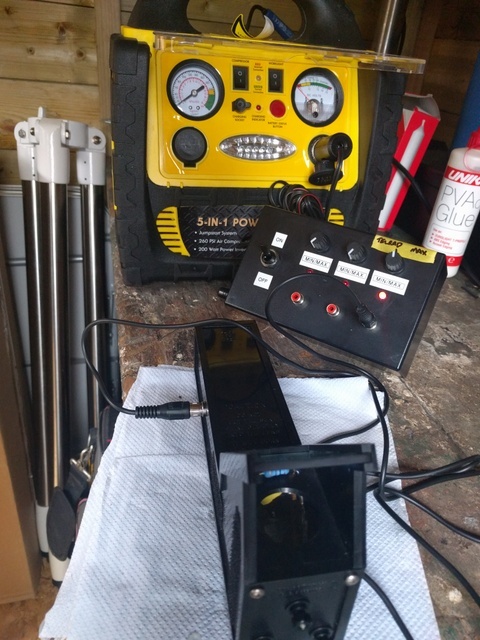 I connected the Telrad dew heater to the home made dew controller and that in turn to the power pack. At final test, I left the rig running for a few minutes, regularly touching the resistor to try to gauge if the temperature was steady, or increasing. I come to the conclusion that a constant temperature had been achieved, and so I increased the power at small increments. I increased the power to a point where I felt the resistor was perhaps getting a little too warm. So, I decided to mark the dial on the dew controller with a maximum dial setting that I should adhere to when it is used. As yet, I haven’t had the chance to use the set up at night. This time of year, the astronomy hobby kind of goes into a state of semi-retirement because of the light nights, but I certainly can’t wait to get it out under the stars and give it a try! Hi! Thanks for visiting my page and taking the time to leave a question. I have used this several times since I put it together. I'm pleased to say that since I started using it, I haven't had problems with dew. I've used it in some rural locations around here renown for their dew. On my dew controller, I found it's important to mark the maximum value on the know that I want to turn the temperature up to. Just in case it gets too warm. I'm very pleased with it though.